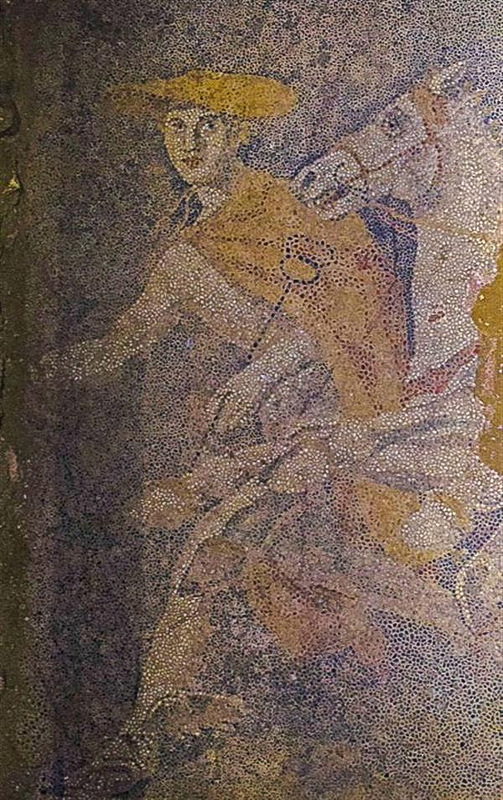 Mosaic floor of the second chamber of Kastas tomb depicting the abduction of Persephone by Hades. The pictures released by the Hellenic Ministry of Culture on October 16, 2014 show that the floor behind the gate with the caryatids is covered by a mosaic that depicts Hermes leading a chariot driven by Hades who has just abducted Persephone. This is a well known and repeated theme in ancient Greek art, and it is very similar to a abduction of Persephone fresco found in the royal tombs at Vergina. In that fresco painting, the charioteer is identified as Hades in the process of carrying away Persephone, with a lamenting female figure (Demeter) left behind. It is a typical Hellenic depiction of the "abduction of Persephone" myth, found not only in these two tombs but also in numerous amphora paintings from the 4th century. 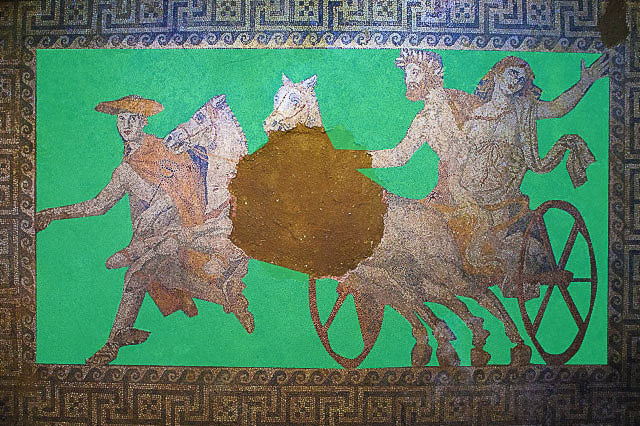 The Kasta tomb mosaic depicts only two horses, as opposed to the four in the Vergina tomb, but variations on a theme are not unusual in ancient Greek mythological depictions. Besides, the narrow chamber would not allow an artists the space for a more elongated composition with four horses. 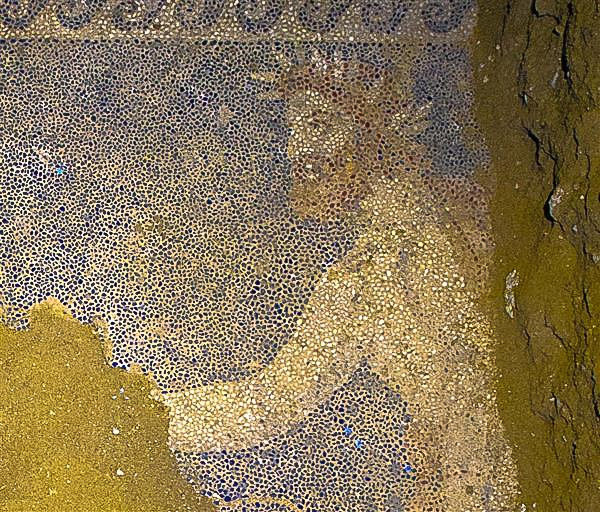 This Amphipolis mosaic depiction of Persephone's abduction by Hades is a masterpiece in its own right, so let's look at some of the artistic features that make it so. We will explore the mosaic guided only by the low resolution pictures that were released today. 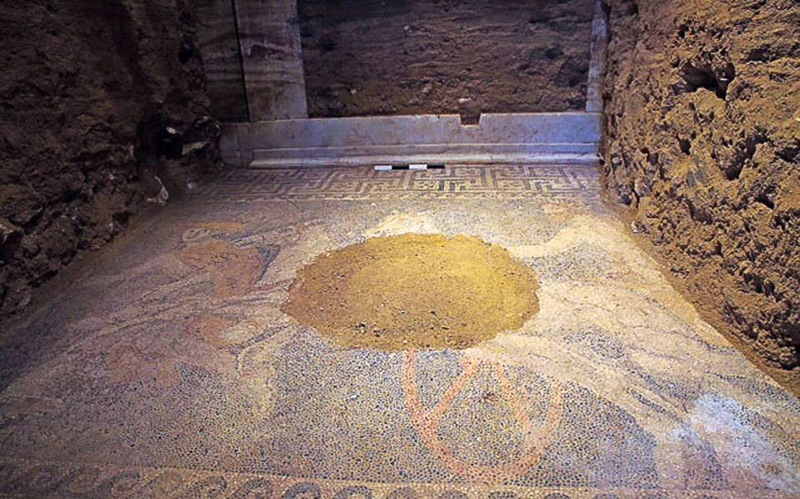 While they give us a good impression of the overall composition, it is impossible to gauge the sense of scale, texture, sheen, and above all color, from these photographs, so we'll leave the analysis of these elements for when we can actually lay our eyes on the real mosaic. 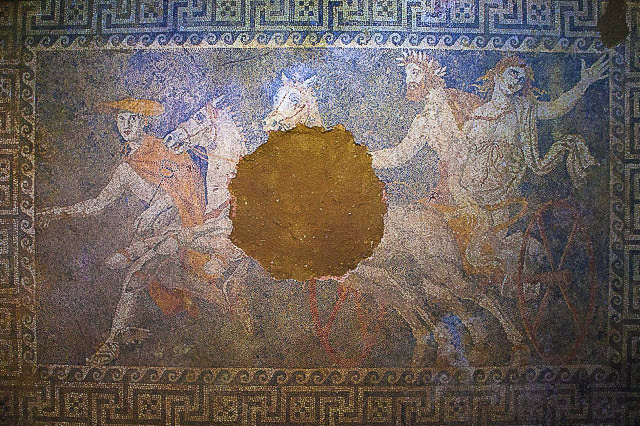 One of the obvious features you probably notice in this Amhipolis mosaic is that every single figure, including the horses touches a part of the meandering border, giving the composition a sense of "completeness" and structural integrity. The artist commands the entire allotted space and its elements with subtlety and precision of both intent and technique. He divides the rectangle it in a number of abstract shapes that neatly confine the figurative elements within their borders. The positive and negative shapes and the figures fill the rectangle in roughly equal spatial proportions. The figures are not floating in an infinite soup of space, but are precisely positioned in a definitive and restrictive area. What viewers would consider "background" and what artists call "negative space" acquires definitive borders and shape - every "pixel" is accounted for, and we feel secure that this known part of the universe withing the borders is logical, explainable, and orderly. The artist enhances the story with simple gestures and lines, which create a cinematic approach where the viewer has caught a fleeting glimpse of a continuous action in a space and time. We can perceive and trace an implied line that spans the left arm of Persephone, the right arm of Hades, the reins, the two horses' front legs, and to Hermes' legs (squint at the picture to lose the details). They all form a radical vector that divides the rectangular composition diagonally. This simple convention helps the viewer perceive "motion" in a static picture; typically, diagonals connote excitement and motion, and horizontal lines bestow a sense of static tranquility. To get a sense of the movement, allow your eyeballs to roll down that central diagonal line. Doesn't it seem that you automatically start a the top right and pick up speed toward the bottom left? Our awareness of gravity affects the way we perceive motion in pictures and artists from all eras know how to use this fact to guide te viewer's overall impression of time. While the formal elements denote a solid viewing experience, the scene takes a step beyond formalities. In a not so subtle twist, one we might easily miss or take for granted, the artist takes us beyond the borders of the actual mosaic and engages us to be part of the story, to construct a picture beyond it. He does it with three gestures: with Persephone's left arm and gaze, with Hermes' right hand, and with two faces that stare at us head-on. On the west end of the fresco, Hermes' arm is pointing forward, with the end of his fingers almost touching the void beyond the border. At the same time he gazes in our eyes with a mysterious expression - seemingly a mixture of surprise to see us there, a stern browbeating asking us to avert our glance from the scene, or a sly invitation to follow him. In any case, with his gaze toward us and with his hand pointing forward he engages in a brazen act of communicating with us, telling us where they are going and that he is aware we are there. On the corner where the east edge meets the north border, Persephone's left arm is raised either as a waiving motion or in asking for help. Her head leans back in a sweet expression that betrays acceptance of her fate while her gaze sweeps the world behind. But who is she communicating with? We don't know. They are beyond the borders of the composition, and this little fact makes us aware of a much bigger, invisible and infinite space beyond the mosaic. Viewers are not usually aware, but one of the most powerful element of a composition is the line of sight of the figures. We automatically tend to follow someone's gaze to see what they are looking at. This line, from a figure's eyes toward something in their view has been a powerful element in the art of any era. 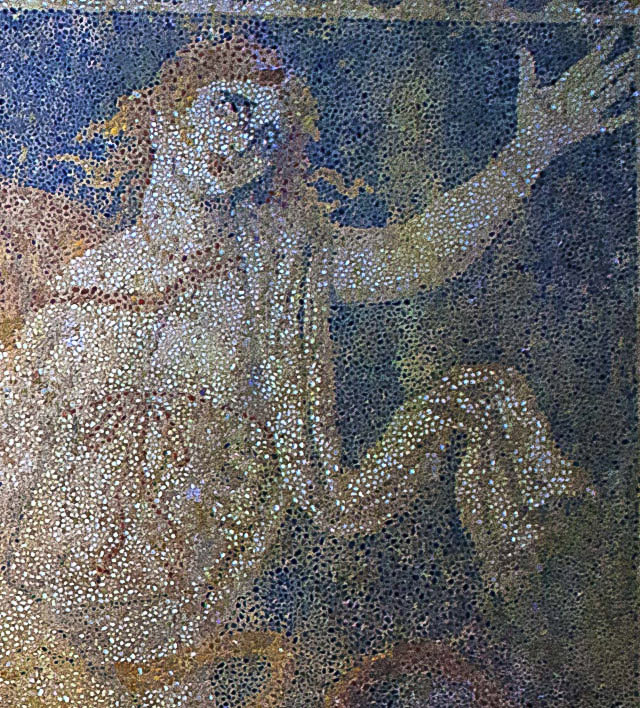 Here, in the Amphipolis tomb mosaic, the eyes gaze back and forth in an energetic exchange that reveals a sense of apprehension and nervousness. Take a look at all the heads in line: one face looks toward our space, while the next looks forward in the mosaic's space. Hermes stares at us (x), the leading horse stares forward (-), the second horse stares at us (u), Hades stares forward (-), and Persephone stares behind us (x). Arguably, as formally eloquent as it is, the most important element of this composition is its interaction with the viewer and the dialogue it opens. Two of the five figures have turned to look at us, in a moment of revelation - as if they are surprised to see us there. Unintentionally, we came upon a profound moment, but we startled the horse, and caught Hermes' attention. We should feel lucky that Hades hasn't noticed we are there yet.